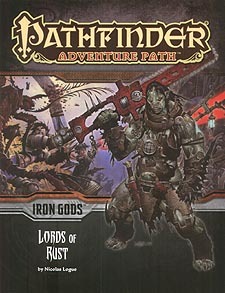 "Lords of Rust", a Pathfinder Adventure Path for 4th level characters, by Nicolas Logue. Insight into the faith of Brigh, the goddess of clockwork, invention and time. Four new monsters, by Adam Daigle, Nicolas Logue and Sean K. Reynolds.